Lyn Perry, Writer: Name That Antho Contest! This is a compilation of the funniest fantasy and sci-fi humor writing in the galaxy, the known universe, all nine-million planes of existence! (Okay, well, maybe the surrounding five blocks.) Featuring more than 30 short stories, limericks, poems, and art by break-out authors and seasoned veterans! "... a squeaky-clean bathroom buddy." Here is the exceptional cover art by Swedish artist Richard Svensson. 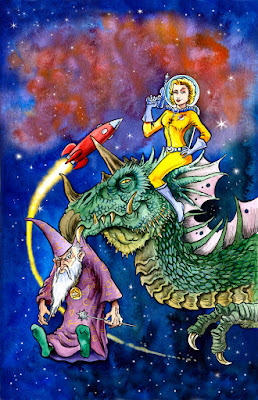 Adventures in space of a hot space explorerine and her trusty dragon spike!!! Best I could come up with...but hey sounds like loads of fun!!! Now everyone knows your secret to making great titles! lol , Thanks all. Wishing you a great end to your week!